Chelsea avoided a third successive home Premier League defeat with a convincing and desperately needed victory over struggling Wolves. Skipper John Terry headed the hosts ahead early on and close-range strikes from Daniel Sturridge and Juan Mata meant the match was as good as settled by the interval. 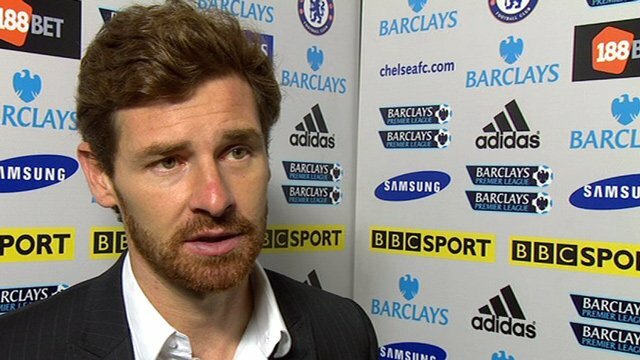 And, although the Blues had numerous chances to add to their lead after the break, under-pressure manager Andre-Villas Boas will just be relieved to restore some confidence after a dreadful run. Having lost three of their last five league games - and with two wins from seven in all competitions - anything but a victory was unthinkable for Villas-Boas. The early signs were good for the home side and settled an edgy Stamford Bridge crowd. Raul Meireles sent a bobbling shot across goal and narrowly wide, while man-of-the-match Ramires went even closer when, after robbing the ponderous Nenad Milijas in midfield, his low strike was brilliantly diverted wide by goalkeeper Wayne Hennessey. From the resulting corner Blues skipper Terry truly settled the nerves, meeting Mata's centre at the front post and sending the ball into the far corner. Terry's programme notes had talked of the need to stand up, take responsibility and get back to winning ways before the title race drifts away. And his goal certainly backed up his words and laid the platform for a vital win against a Wolves side who struggled to retain possession in the face of a bustling and energetic home midfield display. Mata, Ramires and Meireles enjoyed too much freedom and Oriol Romeu, who was making his first league start in place of Frank Lampard, had a remarkably easy afternoon dictating the play from just in front of the back four. Mata smashed a shot over the bar following good work by Branislav Ivanovic on the right. But Chelsea were particularly threatening on the left and Meireles and the outstanding Mata combined superbly to set up the second goal when the Spaniard eluded Ronald Zubar's desperate challenge and picked out Sturridge, who guided the ball home from six yards. Wolves had looked lively enough until that 29th-minute goal. But, although Stephen Ward then sent a header over the bar and the visitors brought on Sylvan Ebanks-Blake for Milijas and went with two up front, their defence was creaking under the incessant home pressure. Sturridge almost added a third when he cut in from the right and unleashed a vicious, left-foot strike that Hennessey untidily palmed away. And Mata did make it three seconds before the interval, turning in Ashley Cole's inviting left-wing cross after Didier Drogba's initial burst on the left flank. To their credit, Wolves responded and enjoyed their best spell just after the break. Steven Fletcher shot just wide and a sustained spell of pressure saw several close calls for the home defence. Chelsea still created the better openings and an out-of-sorts Drogba fired an effort wide and Hennessey produced a fine double save to keep out fierce Sturridge and Mata strikes. Blues keeper Petr Cech pulled off an equally impressive double block to deny Matthew Jarvis and Fletcher. But neither side could find a goal in the second half and Chelsea held on to secure only their third clean sheet in the league this season. However, welcome as the shut-out was, Villas-Boas will know this victory was a necessity and sterner tests are to come against in-form Newcastle and Manchester City in the coming weeks - not to mention the Champions League showdown with Valencia. "I think we can (win the title). We have most of the same players (who have won the title before). We have the talent and belief will be the last thing to die with us. "In my opinion chaos happened. We were exposed a couple of times with group mistakes (in recent games). "Now we have to correct them to make sure we are on the right track. It's a good challenge for the team and hopefully we can now respond in this period." "It was not good enough from us. At half-time I asked them to salvage a bit of pride and self-respect. "Our fans were fabulous. They paid £50 and at least we gave them something to cheer. "Although we did not brighten their experience too much, at least we gave them something to cheer about in the second half." 90:00+2:04 The referee ends the match. 90:00+1:46 Unfair challenge on Oriol Romeu by David Edwards results in a free kick. Juan Mata takes the free kick. 90:00+1:15 Corner taken left-footed by Juan Mata. 90:00+0:38 Fernando Torres delivers the ball, clearance by Roger Johnson. Inswinging corner taken by Juan Mata from the left by-line played to the near post, clearance made by Roger Johnson. Correction - 90:00+0:04 Matthew Jarvis delivers the ball, Sylvan Ebanks-Blake takes a shot. Save made by Petr Cech. 90:00+0:04 The ball is sent over by Matthew Jarvis, Sylvan Ebanks-Blake takes a shot. Save by Petr Cech. 89:03 Booking John Terry goes into the referee's book. 87:38 Corner taken by Juan Mata from the right by-line played to the near post, clearance by Stephen Ward. 86:07 Jose Bosingwa sends in a cross, save by Wayne Hennessey. 85:46 Centre by Anthony Forde, clearance made by John Terry. 84:54 Fernando Torres takes a shot. Wayne Hennessey makes a save. 83:35 Free kick awarded for an unfair challenge on George Elokobi by Fernando Torres. Wayne Hennessey takes the indirect free kick. 82:50 Substitution Adlene Guedioura is brought on as a substitute for Steven Fletcher. 80:49 Unfair challenge on Karl Henry by Oriol Romeu results in a free kick. Karl Henry takes the indirect free kick. 80:00 The ball is crossed by Juan Mata. 78:15 Juan Mata takes a inswinging corner. 77:28 Sylvan Ebanks-Blake has shot on goal from just outside the penalty box which goes wide of the right-hand upright. 76:20 Substitution Fernando Torres comes on in place of Didier Drogba. 76:20 Substitution Jose Bosingwa on for Branislav Ivanovic. 76:20 Effort from inside the area by Daniel Sturridge misses to the right of the goal. 76:12 The ball is delivered by Juan Mata. Correction - 73:50 Substitution (Wolverhampton) makes a substitution, with Anthony Forde coming on for Ronald Zubar. Correction - 73:50 Matthew Jarvis takes a shot. Save by Petr Cech. Stephen Ward takes a shot. Petr Cech makes a save. 73:50 Substitution Anthony Forde comes on in place of Ronald Zubar. 73:50 Matthew Jarvis takes a shot. Save made by Petr Cech. Steven Fletcher takes a shot. Save made by Petr Cech. 73:04 Daniel Sturridge sends in a cross, save by Wayne Hennessey. 72:02 Daniel Sturridge takes a shot. Save made by Wayne Hennessey. Juan Mata takes a shot. Save by Wayne Hennessey. 71:25 Daniel Sturridge takes a shot. Save made by Wayne Hennessey. 68:37 Substitution Frank Lampard replaces Raul Meireles. 68:37 A cross is delivered by Matthew Jarvis, Unfair challenge on Ashley Cole by Sylvan Ebanks-Blake results in a free kick. Free kick taken by Petr Cech. 68:07 Unfair challenge on Stephen Ward by Didier Drogba results in a free kick. Stephen Ward takes the direct free kick. 67:18 Daniel Sturridge concedes a free kick for a foul on Ronald Zubar. Free kick taken by Wayne Hennessey. 65:23 The ball is sent over by Didier Drogba, clearance by Christophe Berra. 64:21 Ashley Cole gives away a free kick for an unfair challenge on Ronald Zubar. Matthew Jarvis delivers the ball from the free kick right-footed from right wing, clearance by Juan Mata. The ball is delivered by Steven Fletcher, save made by Petr Cech. 62:58 Didier Drogba produces a right-footed shot from outside the penalty box and misses wide left of the target. 59:35 Didier Drogba sends in a cross, David Edwards manages to make a clearance. 58:26 A cross is delivered by Daniel Sturridge, clearance by Roger Johnson. Juan Mata takes a outswinging corner from the left by-line played to the near post. 56:57 The ball is delivered by Stephen Ward, save by Petr Cech. 56:41 The ball is crossed by Karl Henry. 56:12 Corner taken right-footed by Matthew Jarvis. 53:53 Didier Drogba gives away a free kick for an unfair challenge on Roger Johnson. Wayne Hennessey restarts play with the free kick. 52:21 Stephen Ward produces a right-footed shot from the edge of the area and misses to the left of the goal. 50:05 Ramires has an effort at goal from 30 yards. Wayne Hennessey makes a save. 49:28 Ramires produces a cross, Roger Johnson manages to make a clearance. 45:00+2:01 The match has reached half-time. 45:00+1:33 Juan Mata produces a cross, George Elokobi makes a clearance. 45:00+0:58 David Edwards challenges Raul Meireles unfairly and gives away a free kick. Petr Cech restarts play with the free kick. Correction - 44:52 Ashley Cole provided the assist for the goal. Correction - 44:52 GOAL - Juan Mata:Chelsea 3 - 0 Wolverhampton Juan Mata scores a goal from deep inside the penalty box high into the middle of the goal. Chelsea 3-0 Wolverhampton. 44:52 The assist for the goal came from Ashley Cole. 44:52 GOAL - Juan Mata:Chelsea 3 - 0 Wolverhampton Juan Mata fires in a goal from inside the area high into the middle of the goal. Chelsea 3-0 Wolverhampton. 42:56 Oriol Romeu concedes a free kick for a foul on Ronald Zubar. Ronald Zubar takes the indirect free kick. 42:10 Ashley Cole has an effort at goal from outside the box which misses left. 40:57 Raul Meireles takes a shot. Save by Wayne Hennessey. 40:23 Inswinging corner taken right-footed by Raul Meireles from the left by-line, clearance made by Karl Henry. 39:22 Daniel Sturridge takes a shot. Save by Wayne Hennessey. Juan Mata decides to take the corner short. Juan Mata produces a cross. 37:30 Substitution Sylvan Ebanks-Blake is brought on as a substitute for Nenad Milijas. 34:03 Juan Mata crosses the ball from the free kick left-footed from right wing, save by Wayne Hennessey. 34:03 Booking The referee shows Karl Henry a yellow card for unsporting behaviour. 33:55 Free kick awarded for an unfair challenge on Ramires by Karl Henry. 32:34 Didier Drogba fouled by Christophe Berra, the ref awards a free kick. Didier Drogba produces a shot on goal direct from the free kick. 31:35 Outswinging corner taken left-footed by Stephen Ward from the left by-line, David Edwards has a headed effort at goal from close range which goes wide left of the target. 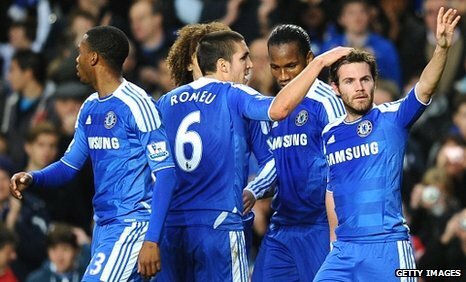 Correction - 28:56 The assist for the goal came from Juan Mata. Correction - 28:56 GOAL - Daniel Sturridge:Chelsea 2 - 0 Wolverhampton Daniel Sturridge scores a goal from inside the six-yard box low into the middle of the goal. Chelsea 2-0 Wolverhampton. 28:56 Assist by Juan Mata. 28:56 GOAL - Daniel Sturridge:Chelsea 2 - 0 Wolverhampton Daniel Sturridge fires in a goal from inside the six-yard box low into the middle of the goal. Chelsea 2-0 Wolverhampton. 26:15 Free kick awarded for an unfair challenge on Christophe Berra by Didier Drogba. Wayne Hennessey restarts play with the free kick. 25:08 Ashley Cole produces a cross, George Elokobi makes a clearance. Juan Mata takes a inswinging corner to the near post, Stephen Ward manages to make a clearance. 22:21 The ball is delivered by Matthew Jarvis, Header from deep inside the area by Stephen Ward goes harmlessly over the crossbar. 20:19 Unfair challenge on Ashley Cole by Ronald Zubar results in a free kick. Juan Mata takes the indirect free kick. 17:51 The assistant referee signals for offside against Didier Drogba. Free kick taken by Wayne Hennessey. 16:18 Branislav Ivanovic takes the free kick. 16:18 Booking Booking for David Edwards. 16:07 Free kick awarded for an unfair challenge on Ramires by David Edwards. Correction - 15:16 Steven Fletcher fouled by Oriol Romeu, the ref awards a free kick. Direct free kick taken by Nenad Milijas. 15:16 Steven Fletcher fouled by Oriol Romeu, the ref awards a free kick. Nenad Milijas takes the direct free kick. 13:41 David Edwards handles the ball and concedes a free kick. Oriol Romeu takes the indirect free kick. 10:59 David Edwards concedes a free kick for a foul on Ashley Cole. Petr Cech restarts play with the free kick. 10:09 The ball is sent over by Matthew Jarvis. 9:29 The ball is crossed by Branislav Ivanovic, Effort on goal by Juan Mata from inside the penalty area goes harmlessly over the bar. 9:06 Free kick awarded for an unfair challenge on Ramires by Nenad Milijas. Raul Meireles takes the direct free kick. 6:10 Assist on the goal came from Juan Mata. 6:10 GOAL - John Terry:Chelsea 1 - 0 Wolverhampton John Terry finds the back of the net with a headed goal from inside the penalty area. Chelsea 1-0 Wolverhampton. 5:14 Free kick awarded for an unfair challenge on Christophe Berra by Juan Mata. Christophe Berra takes the free kick. 2:44 George Elokobi challenges Daniel Sturridge unfairly and gives away a free kick. Free kick crossed left-footed by Juan Mata from right wing, save by Wayne Hennessey. 1:17 Shot from outside the box by Raul Meireles misses to the left of the goal. 0:22 Stephen Ward produces a cross, clearance by John Terry.